In small skillet, toast pecans over medium heat 5 minutes, stirring occasionally. Set aside to cool. Meanwhile, in small bowl, whisk apple juice, vinegar and honey with a wire whisk. Whisk in vegetable oil until slightly thick and well blended. On large serving platter, arrange thick layer of greens. Drizzle with dressing. 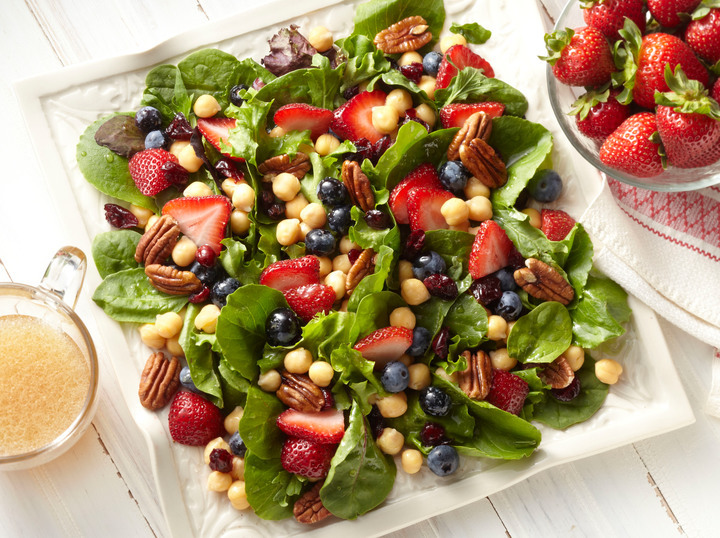 Top with beans, strawberries, blueberries, cranberries and pecans. Serve immediately. Tip: You can substitute a purchased sweet vinaigrette or poppyseed dressing for the homemade dressing if you prefer.